Subject: The Event Deck is Done!!!! 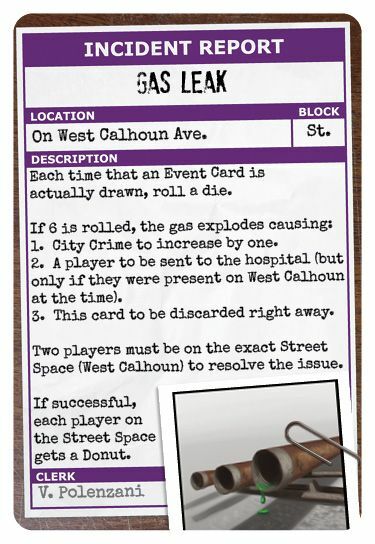 Note: What you see here are the 2nd Edition versions of the original Event Cards. What's coming next to this thread? It's something we're calling the "Other Cards". These "Other Cards" will be posted soon, so stay tuned! Wanna know more about 'em? Help for the Color Blind! 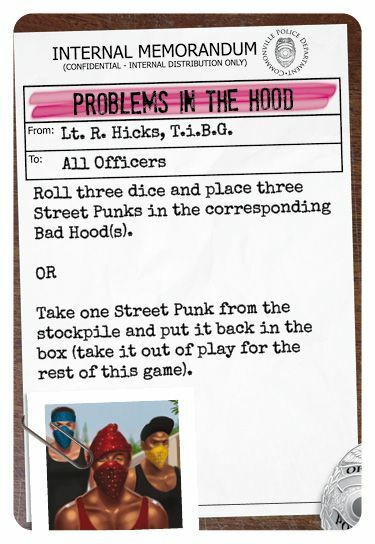 Not gettin' your bottom kicked by Punks in Police Precinct. 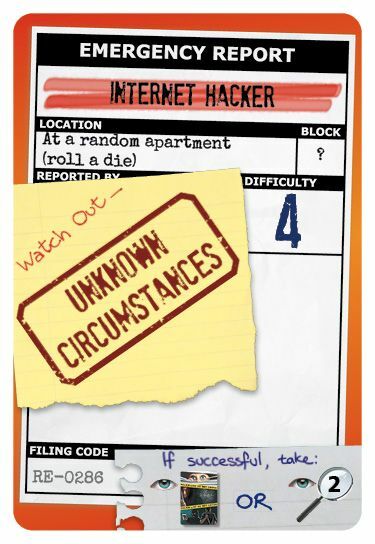 Don't laugh, because it could happen to YOU! It's those pesky Punks that just keep coming and coming onto the board all game. It's never ending! 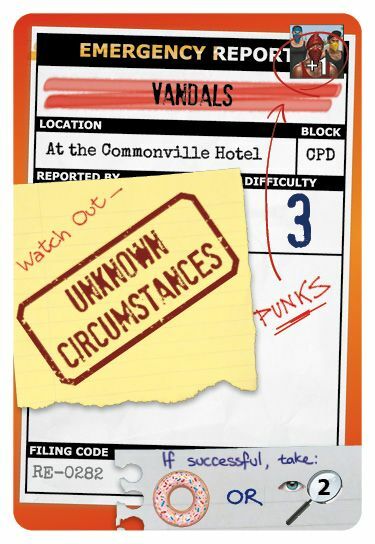 Unless you forget to put them out!!! 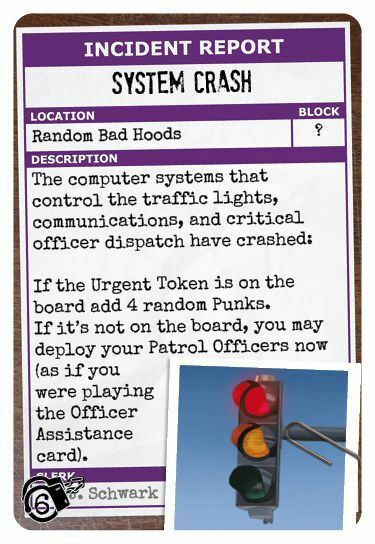 This is something that can happen in the excitement of a game, it is possible to draw an Emergency card and forget to add Punks. If this happens even once, it could significantly disturb the delicate balance of the game. Which is why we ramped-up the support for NOT forgetting. 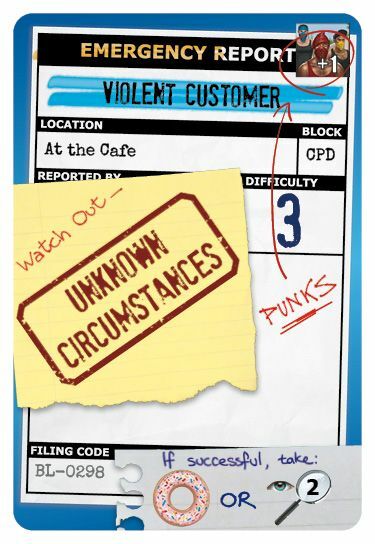 The Word "Punks" is written prominently on the card too! This danger is much much lower. 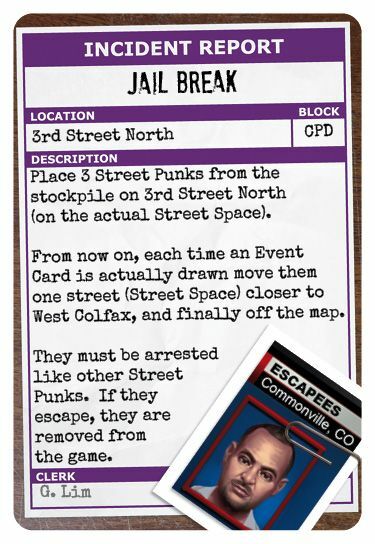 We're gonna call it completely "Arrested!" Certain cards from the 1st Edition left people with a few questions here and there. We think we have taken care of all that with a few changes. Let us know if you notice anything else that you think needs to be made more clear. With the 2nd Edition that is what you get. 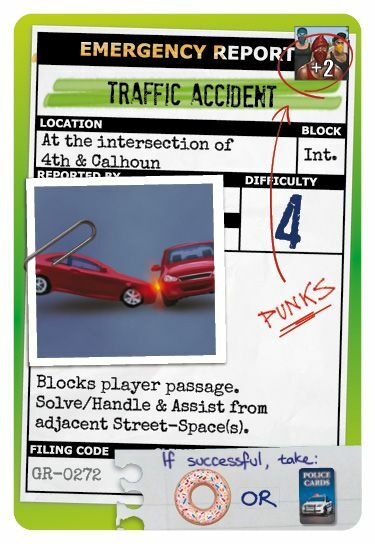 We mention the block number right on the card. 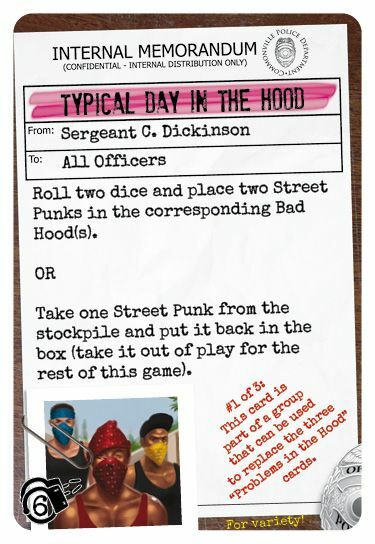 It just makes it a little easier for the Rookies on the force (new players). The block numbers work on the primary side of the board. After you get the hang of how to play the game, and you want some additional challenge, try the Unterbelly. It will just take an extra second to find buildings the first time around, but not so bad because the buildings do have a very distinct look to them and if you learn how to play on the primary said, then finding buildings should be pretty darned easy when you graduate to the Unterbelly. It has never been our goal to have new art of the the 2nd Edition. The goal has been all about New Graphic Design. A new look and feel is what we wanted. That was a fun process to be working with George again and Katie was the one who did the cool backgrounds for images (Burglars, etc.). Maybe that's it. Can't think of any other details on these cards that I want you guys to know right now except to say that, we are lookin' forward to gettin' 'em in your hands asap! They are all Event Cards of some sort. Some are Emergencies and others are Special Event Cards. 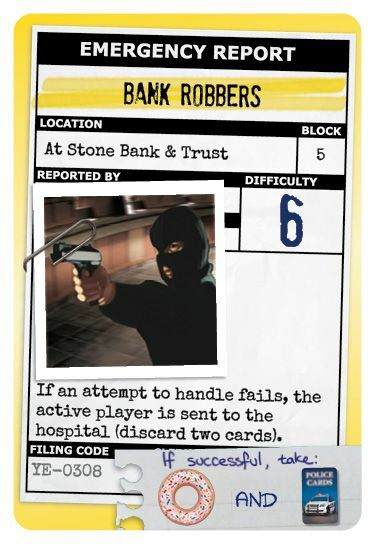 We are not sure how many of these cards will actually be printed right now. Determining this will involve factoring in the cost and other issues. 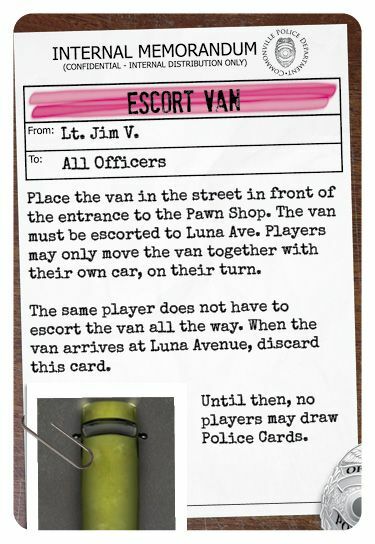 One of these cards (Naked Man) was part of a Stretch Goal, so it WILL for sure get printed now (with the 2nd Edition) and for that matter, we may end up printing ALL of the rest of the cards shown here (below). That just remains to be seen. 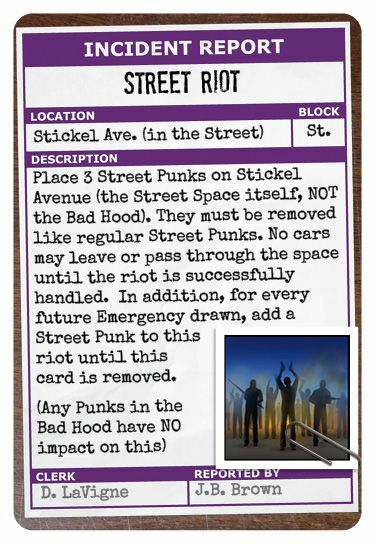 Of which we have one of each color except two Greenies because the Rioting Gangs set actually had NO green Event, so we ideally want to restore balance to the color mix at this time. 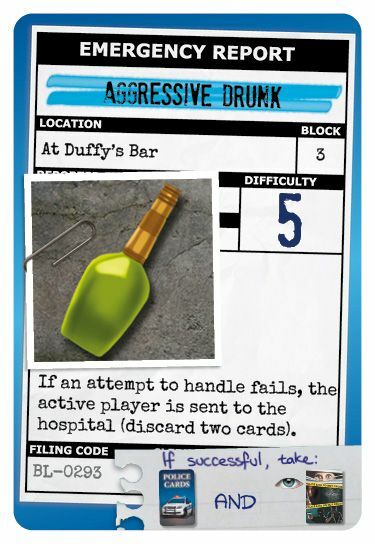 This one's a Richard card with some minor tweaks, though through sheer coincidence Jeff suggested "A person under the influence of methamphetamine causing a public disturbance", so thanks to BOTH! Once again thanks to BOTH Richard & Jeff! The mechanics are Richard inspired and the theme is courtesy of Jeff. Dan King all the way! This is another Richard card with some very minor tweaks. 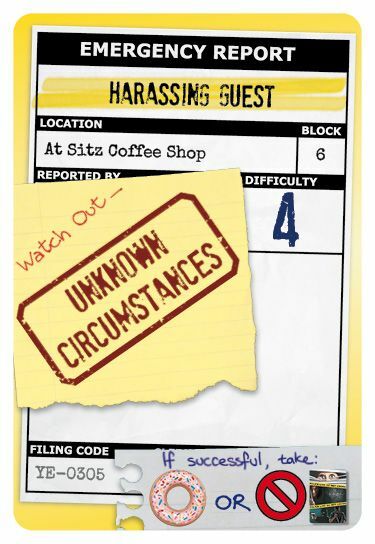 Fans of the game have enjoyed the fact that we offered some of the Unknown Circumstance Tokens as "BLANK", allowing one to "create your own". 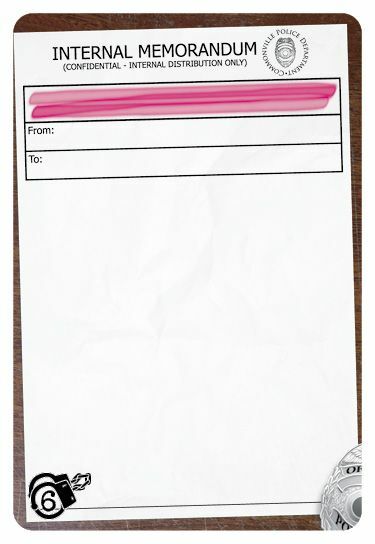 We figured that this was as good a moment as any to do that, and rather than making them completely blank, we thought you might like to have the form built-in. 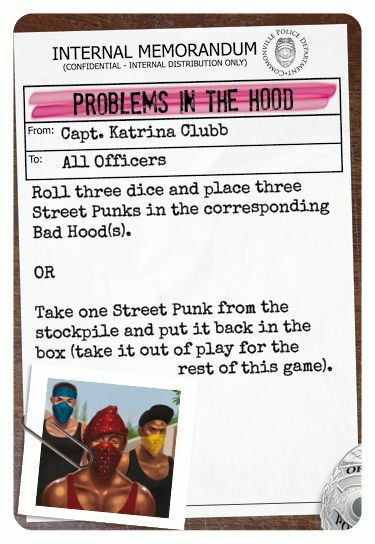 This is a set of 3 cards that can be used to replace the Problems in the Hood set of cards. 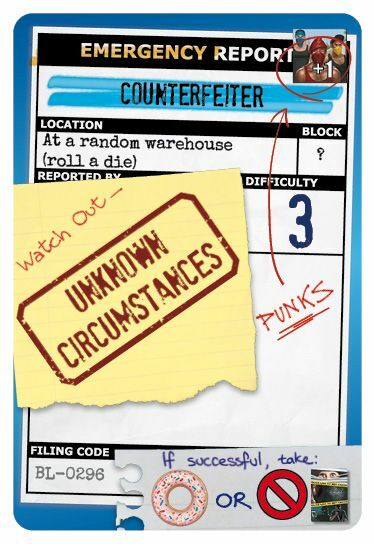 By using these cards, players can gain new variety, greater challenges, and are faced with tougher choices. what else should I tell you about these cards? There is actually a lot to cover. 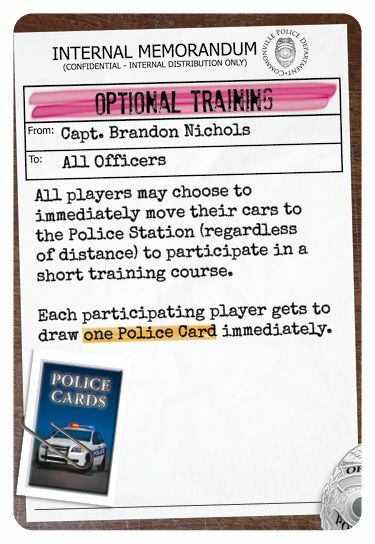 Early on in the Police Precinct series, we (using fan in-put) decided that each expansionary card set would have it's own unique marking. 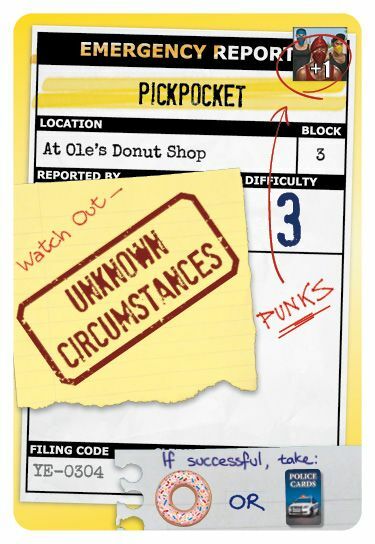 We decided to have handcuffs be the initial icon used for this purpose. At some point we may change the icon. 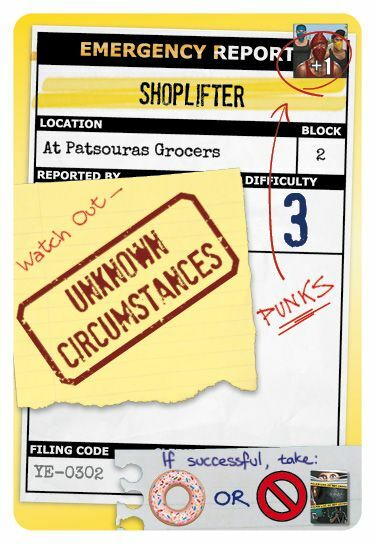 This might happen for any number of reasons, but for now Hand-cuffs have the day. 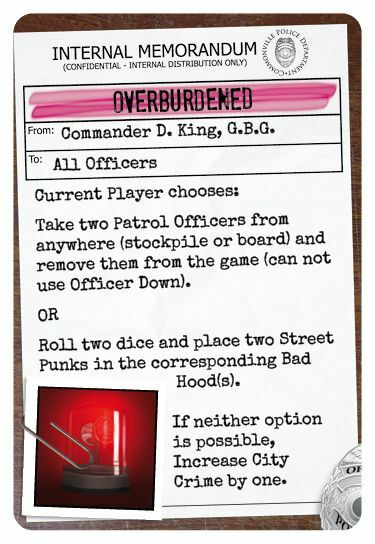 All of the above items add to the Event Deck, except THE HEAT which is a stand alone deck and acts as an expansion for the game. 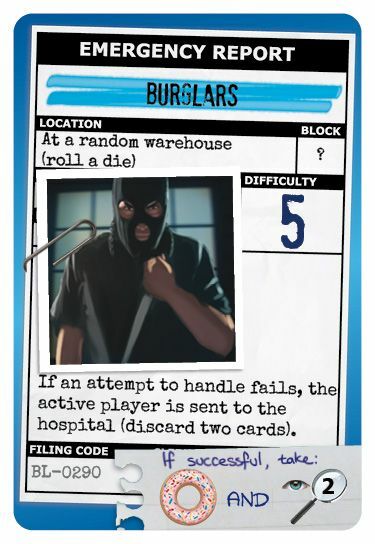 Any and all cards that actually do get published now as part of this "extra" set of cards, will have the Cuffs with the digit 6 inside in the lower left corner as shown above. Ole Steiness grew up in Denmark watching American Police shows. That is what inspired Police Precinct, meaning all the Cop shows throughout the history of TV (Think Adam 12, Dragnet, etc. all the way up to today's shows). 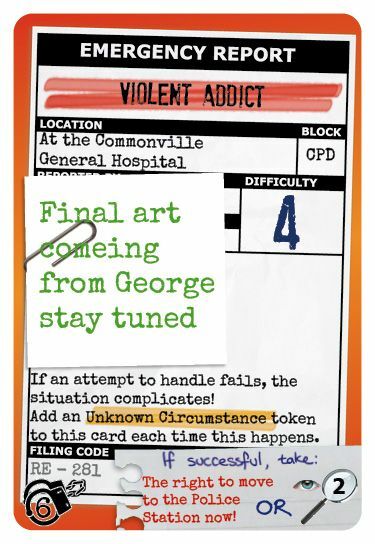 That being the case, Ole and I have decided that each "game" is an "episode" in the series (Including the base-game which is "The Pilot"). 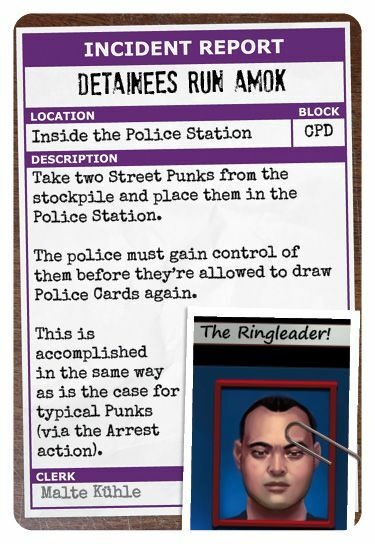 Since we have chosen to treat Police Precinct not only as a game, but also as a TV series, we DO have guest stars on our show from-time-to-time. Like with a TV series, these Guest Stars are celebrities from the industry who are not part of the show on a regular basis. 1. 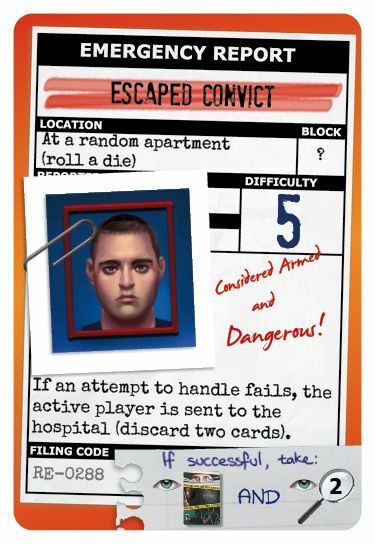 Bart Brunscheen ("The Chief" from the Dice Tower) who inspired the Naked Man card through his real life stories (and great sense of humor) as a cop! Did you know that Bart is a guest star in another show which aired on YouTube and went viral depicting a policeman chasing a car through a building. This "depiction" of a "policeman" is Bart in real life doing his job!!! See if you can find it. 2. 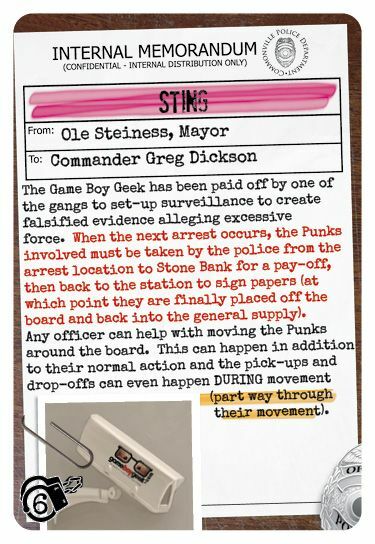 Dan King ("Game Boy Geek" from the Dice Tower) who worked with us on the special event card involving hidden cameras (called "Sting")! 3. 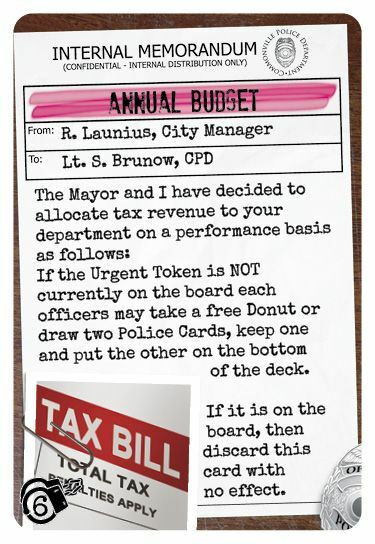 Richard Launius (designer of many great games and a fan of Police Precinct) who has designed several unique cards for the game just for fun (literally for his own copy). He recently showed them to us and all we could say was "WOW!!!" We were then able to utter the words... "Hey do you mind if we use some of these for the latest episode which is going to print soon." (or something like that), to which he said... "Sure" (or some similar words). So now we are back to just thinking WOW! and being very thankful to Sir Richard! 4. Others! 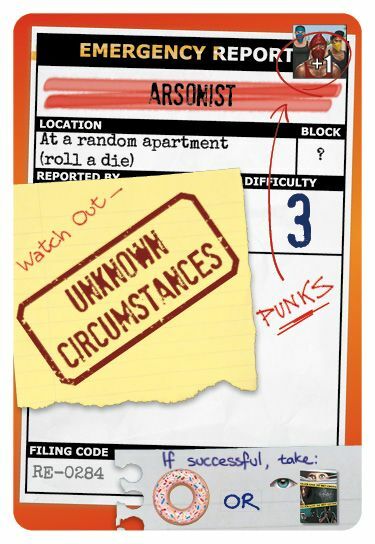 In addition to those listed above, many other wonderful individuals have played rolls in this episode. Too many to mention, but all critical, and to each we say "THANKS"!!!! 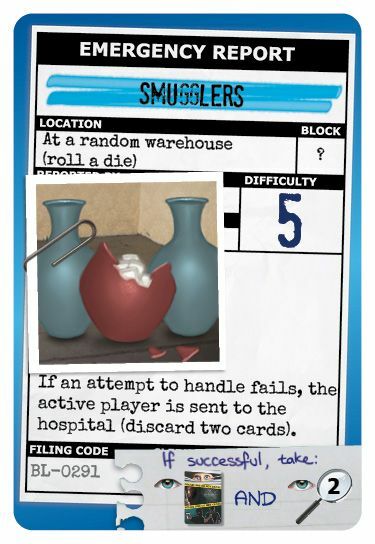 Since it tends to be experienced / advanced players who end up with expansionary items, we worked hard to try to deliver to you cards that are chalk-full of tricky choices and logistical puzzles for you to try to solve. One things that Ole and I have been working on for some time now (in different ways) is getting players back to the Station on a more regular basis. 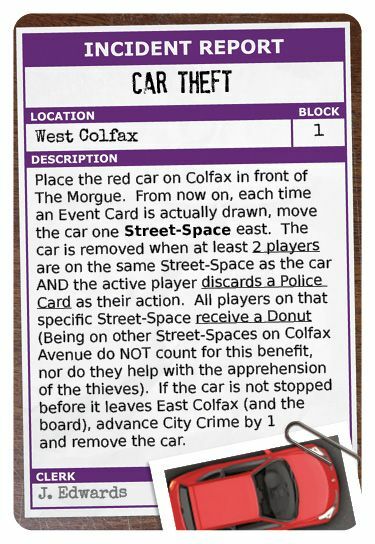 This set of cards addresses this with some of the Rewards allowing this option, AND via Sabotage occurring right in the Station itself! 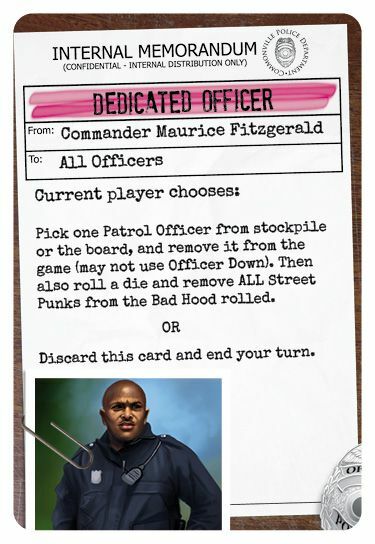 The biggest reason for this desire on our part is so that certain Police Cards can be played more easily. Dan King and others have long been saying that the game needs more, so now we got 'em!!! 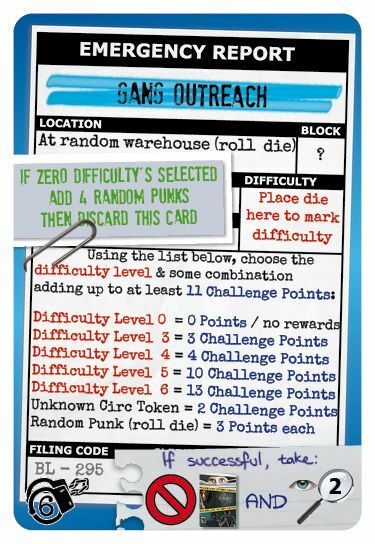 In fact at this point (if we do actually print every single last one of these), we have increased the number of Event Cards by 72% since it was originally printed back in early 2013. Don't worry, there will be plenty more coming down the road! PLEASE let us now, because there is still time to make changes before they get printed. Having been out of the loop for a while, I must ask what might be a dumb question: Is the Event Deck usable with the original edition, and if so, will it be available separately? Thanks. "That is absolutely amazing sir - man - I tell ya - you've put so much thought into everything - each and every card - just SO much work!" "Awesome! And on my birthday too!" 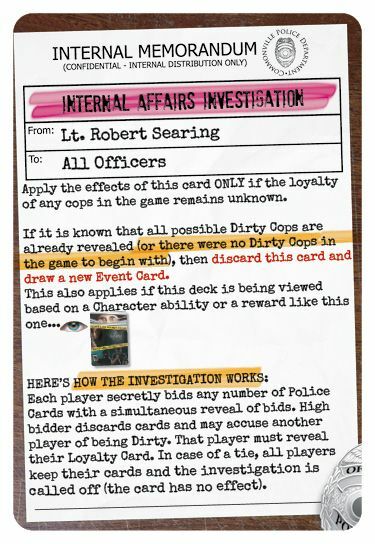 Like you, I'm super pumped to see everything together- the EPIC new board from Katie, the new crime track and murder investigation board, and Jake's new cards--- Really knocked it out of the park Karl- rather than just fixing rules/typos- everything works together. Great work!!! Looks great. Graphic design is very nice. They’re looking sharp! This is gonna be awesome! Can’t wait to play it! The new cards look awesome! I really love the graphical update over the 1e cards. 2e is going to look great! Love the "Other Cards" - I like that the variety of event cards is climbing! The new edition is going to be awesome! Everything look fantastic, I mean this is some really, really excellent stuff. I'm really looking forward to seeing the whole package, it is all coming together so well. Which Kickstarter did you back? 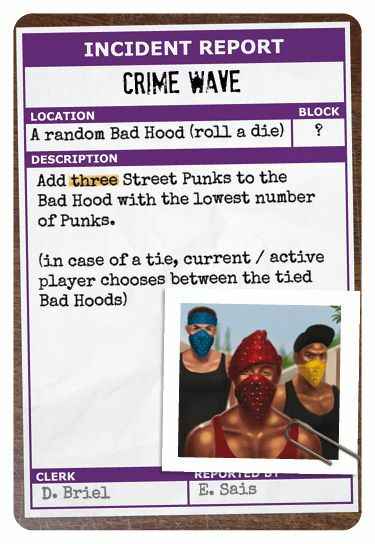 There is one card (from the 2nd Edition) that might sound funny if you were playing it with a 1st edition copy of the game. 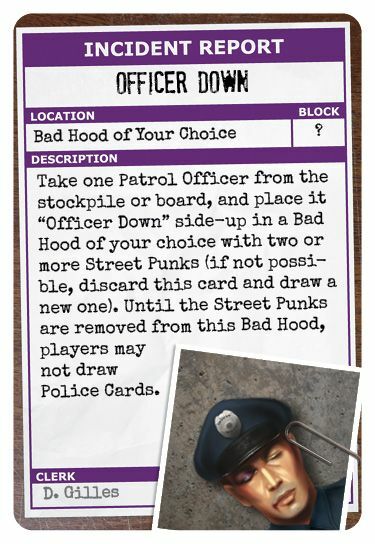 We will have two-sided tokens for the 2nd edition, and one of those tokens is a Patrol Officer who has an Officer Down on the backside. 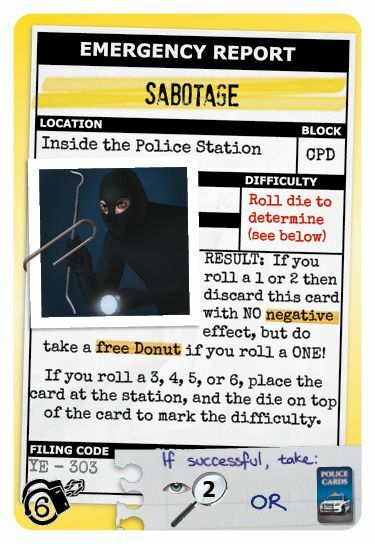 Without that token, it might be confusing to read this card. 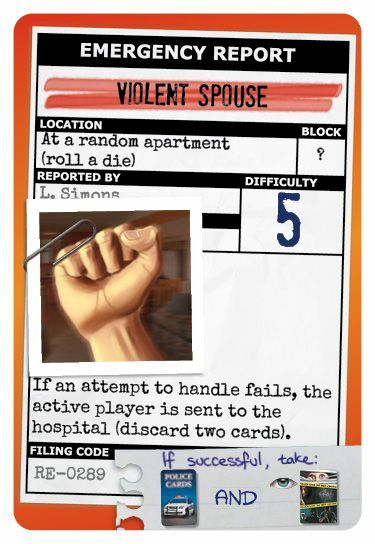 That is the only card I can think of which is like that to any degree. When we post them (here) soon, maybe someone will notice another but I don't think so (speak up if any one does). Been getting some great feedback from our 1st batch of editors and making changes on our end. The card images will be coming here soon. The deck is now posted at the top of this thread! A big thanks goes out to all of the editors that helped us over the past couple days to catch little things about the cards that should be changed (or fixed or improved, etc). Now the NEW "Extra" cards are also posted in this thread. See the 2nd post down from the top. 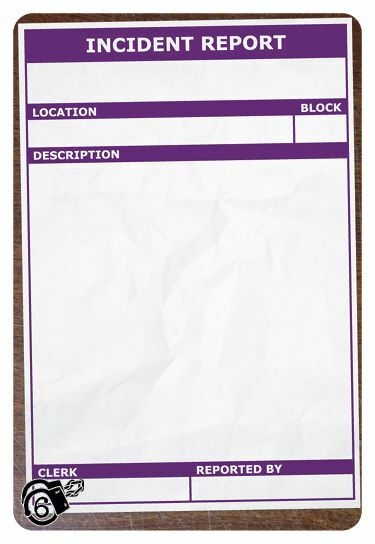 I hope we are able to print them this time around. I think it will be very fun to see what people come up with. I feel like it could be a wonderful source of ideas for new cards. I'm sure we will print them, and likely NOW! Actually, "Sir Richard" is incorrect. He should be referred to as "HRH, King Richard!" 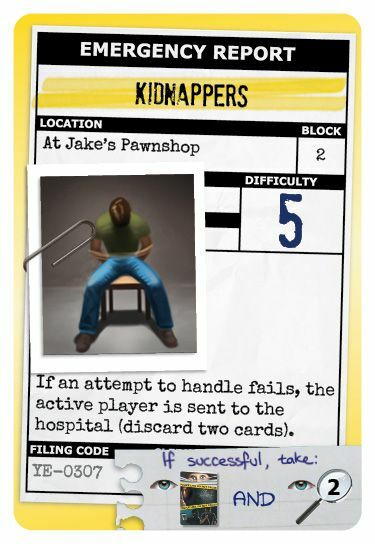 After all, he is the COO/CEO of King Richard Games LLC. PS Any decision yet, regarding an update kit for first edition owners? When I suggested the idea, I used a boa constrictor but you went with a gator, which is even better- this morning on the news I heard that there was an escaped gator in Sheboygan WI (about 25 miles from where I live) that the police had to capture. What an amazing coincidence! Of course, why not have a pet alligator in tropical Wisconsin. It must have been a toss up for them! Should have picked cat or dog I guess! Honestly, who would keep a pet alligator? That actually happened in Denver. There was a "monitor" (gator like creature) released in a pond in Denver and people kept reporting to the Police having seen a gator. I remember this happening. I guess it happens 'round these parts a fair bit. Thanks again Jeff for suggesting this card! 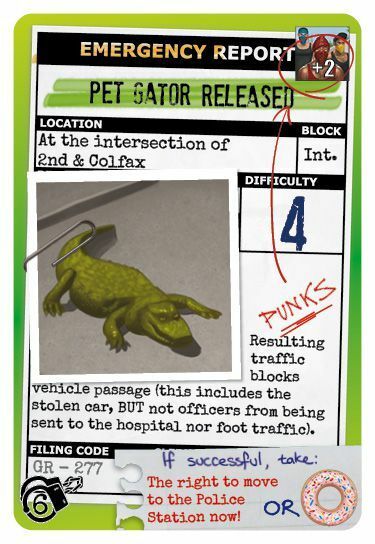 I think the idea of a gator getting loose is very crazy, but also a real-life part of what happens for the Police, which makes it fun to add to the game (like a Naked Guy running in traffic!). Good Point on the "Sir" vs "King"!!!! He is Esteemed and Venerable, and deserves the highest possible title! YES, we are planning on doing something in this regard, and if you stay tuned it will become apparent as soon as we have our ducks in a row. I think some sort of Kickstarter designed for the 1st Edition Folks is in order and should be forthcoming. If you have never backed one of our projects AND you are not on our update list (yet), please sign up. To do this, go to our homepage and scroll to the bottom of the page to see the sign-up form. "Cindy probably knows who's foot that is." I'm not surprised that the gator was caught in Sheboygan. Some pretty interesting stuff goes on there (just Google Sheboygan Odd News). I used to live there & can attest to that. Jeffery - Great idea on the card, btw. Now, I reside in Kenosha. 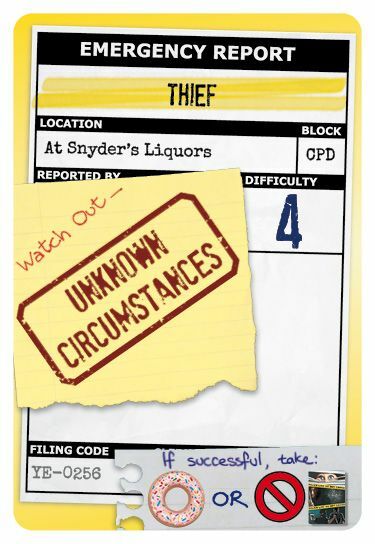 I think its cool that Common Man is using the input of the Kenosha police. I'd say WI is pretty well-represented here. I do not, but I think it's great that she has been instrumental in connecting you with the Kenosha police. The KPD is a very professional organization. Anecdotally, I do know one of the other officers who received the Life Saving Award with Sgt. Cindy F.
So, do you ever game at Rockhead's on Friday nights?